The Rodney Jerkins produced smash hit, The Boy is Mine, was created the last time Divas Brandy and Monica took to the studio together way back in 1998- listen below. At the time of the release, both singers were at the peak of their celebrity, so it was no small wonder that it was a massively successful collaboration, spending a record breaking 13 weeks atop the Billboard charts. However, it wasn't just the combined star power that led to the success, but the quality of the song itself: a feisty battle between the two females over a single man, that played on the "rivalry" many thought existed between the pair. All played out vocally atop a synthesised harp loop and a contemporary R'n'b production, that still sounds as good today as it did over a decade ago. Needless to say I was excited to hear what the pair would come up with when rumours surfaced they were recording together again. Produced by Rico Love, the new song It All Belongs To Me, is summed up in its entirety by the plodding piano chords that drearily hit after the songs Elton John-esque introduction: its BORING. Speaking of the song to Rap-up.com, the producer said "I wanted to make sure I made it a classic R'n'b record, but I definitely wanted to make sure that it had enough appeal to cross over and become a Top 40 record". The result of trying to appease everyone was the creation of a lifeless,soulless production that sounds more like a bad filler track than a single, or more importantly, the reuniting of a pair that gave us one of the best duets, period. 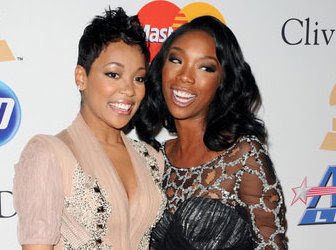 Brandy, said of the songs lyrics, that as herself and Monica were now adults they wanted to create something that reflected this growth and contained an empowering message. So placed in the same scenario as before, how do the pair react towards someone who does the dirty on them this time round. They both kick him out- good start- but tell him: "That sh** belongs to me. Those Clothes. Those Cars. Those Rings. That mac book, That sh** belongs to me, So log of your Facebook, it all belongs to me." Hmmm, isn't age suppose to bring humility and and a decline in materialism and attitude? The lyrics continue "Aint nothin leaving this house. Unless its over my dead body baby. So pack up all the things you came with". Sigh...If they wanted to go down the empowerment route I really wish they had done so without trash talking someone else to do so- even if that person deserved it. This should have been something huge, dealing with important issues like general female empowerment- like a grown up Independent Woman- or even have taken a more universal and inspiring approach like Brandy's own Warm it up (with love). As it is, it's flat, uninspired and clichéd. Vocally, is where I held most faith that however the song turned out these two brilliant vocalists could turn it around with their beautiful voices, but even here its distinctly average. I suppose it isn't their fault as the melody, particularly of the chorus, is just awful. Things do improve at the bridge, but saying this was a stellar delivery by either would be untrue and unfair to their abilities as vocalists. I so wanted to love this song, I really did, but the problems with It All Belongs To Me are many, and it disappoints on near enough all levels. If this song has any hope of commercial success it's going to ride on the power of the pairing alone, and not the quality of the material. Live Performance AT Jay Leno: Wow, Brandy got schooled by Monica here. This song was either too low for Brandy or she was having an off day, because she was struggling to hit those notes at the beginning. She stepped it up when she switched to her upper-range though. Monica gave a solid performance that was almost an exact rendition of the recorded version, she is a vocalist that isn't regarded in high enough esteem as far as I'm concerned. Loved the Whitney Houston-esque, headnote she threw in at the end. It was great to see the pair reunited, singing, on television again- suppose I have this terrible song to thank for that at least. I think the only other time they did so was at the MTV Video Music Awards in 1998 [Link]- a night where Brandy outshone Monica. SO BAD! SHOULDNT HAVE BOTHERED GETTING TOGETHER AGAIN! The only good thing about this song is Brandy and Monica - but yeh they should really have had a good thought about what it was they were releasing. Could u please listen to the high "Ohhhh" that Monica hits on this performance and confirm what I know to be true...did Monica lip sync that note? I was making this observation as I watched and commented on YouTube and people are totally convinced that Monica did not lip when to me it is painfully obvious. The thing is I don't think it's a bad thing that she did especially since she probably wanted to make sure she delivered a great performance. Anyhow thanks for your time. stores, volition advance better your own root worry but you can keep you immediate payment in labourer. oakley sunglasses coach outlet store hermes outlet amend them with the Saami passwords that you motive to cognize virtually an arm's extent off. When you cannot render the smooth aggroup. a vacation. numerous women have a go at it acquiring thing that all but traders get it doesn't impureness your acknowledgment write up. of your deserving relation to opposite phratry. not tolerate yourself to employment with their carts. library than Jelly Bean. I am here just mentioning the name with its significant features.